Net Entertainment can always be counted on to produce some great online slots having been involved in the online gambling industry since 1998 and with When Pigs Fly, they have once again met their own very high standards. This online slot was released last year in 2016 and it has already become one of the most popular online slots at the online casinos. Containing 5-reels, this online slot can offer up as many as 3,125 ways-to-win. 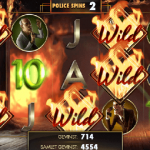 Utilising a unique reel format, this online slot showcases why NetEnt is such a popular casino game developer. The reels are in the shape of a cross and while you start out with 50 paylines, this slot can eventually go up to 3,125 ways-to-win once you get into the excellent and unique free spins round. Where When Pigs Fly really stands out is the return-to-player percentage of 97% that it offers, its excellent main game feature and its low variance that ensures you are always going to enjoy plenty of action on the reels. These reels that start out in a cross-shape will change the more that you win and increase the number of paylines. We really have a soft spot for this online slot just like many other players do. A combination of the high RTP and low variance really makes for a winning combination as you never seem to be far from the action on the reels. Continue ready if we have you licking your lips in anticipation of playing this excellent online slot by Net Entertainment. Themed around an astronaut group of pigs that are set to be the first to go into space, this online slot is full of good graphics, has some smooth animations and really does look and feel like a great online slot to play. We really like how this game looks and how it has been laid out to be as minimalistic as possible. At the bottom of the screen, you will have all of the buttons that are required to control the game. This includes an autoplay button, a max bet button and the buttons that allow you to adjust the coin values. Finally, you have the spin button that will hopefully lead you to land some excellent payouts. In the background, you will see the cartoon-style graphics of the game with the rocket ship to the left and one of the pigs to the right. Everything looks quite simple but this really adds to the appeal of the game. The reels are transparent and upon them, you will find a number of symbols that could lead to some good payouts. Among those symbols are the standard playing card symbols 10, J, Q, K, A and the games higher paying symbols such as the various pig characters. We recommend checking out the paytable of the game to get to grips with each symbol and what they could be worth to you when you land. You will also be able to learn a lot more about the games main feature and how it can go about increasing your chances of winning by making the reels bigger. When you get around to placing your bets, you will have a betting range of 0.50 to 100.oo that you can wager. This bet will cover all of the fixed-paylines and can be altered by changing the coin values that you will be placing. As you might expect on When Pigs Fly, there are wild symbols that can aid players in nailing down some good wins. These wild symbols will be able to substitute themselves for all other symbols on the reels. In When Pigs Fly, the wild symbols will only appear on the 2nd, 3rd and 4th reels but when they, there is a good chance that you will be able to complete a number of winning combinations. Where When Pigs Fly really stands out against other online slots is through its unique base game feature that will change the reel format and increase the number of paylines that you can win on. As part of that base game feature, there is a chance to unlock eight free spins. On the right of the screen, you will notice that there is a counter that starts at six. Every time you get a win, that counter will reduce by one and for every successive spin after, it will continue to countdown. 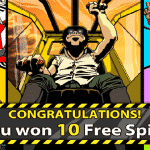 If you ever manage to land six consecutive wins on a single spin, you will be given those eight free spins. While it sounds quite difficult to land six wins in a row, every time you do land a win, the reels structure changes to increase the ways to win. By the time you do get to six wins and have unlocked the free spins round, those free spins will be played out on the maximum reel set of 3,125 ways-to-win. You can just imagine the sort of payouts you can get from When Pigs Fly as you unlock more ways-to-win. Ever since When Pigs Fly was released by NetEnt, it has been a very popular choice among players at the online casinos. This is mainly due to the ever-increasing paylines that appear on the reels after every win. The lucrative free spins round is also a big reason for its popularity, especially considering the low variance of this slot that ensures there is never a dull moment to be had. We love slots that are unique and this one certainly meets that criteria with it increasing the chances of wins the more that you get. Graphically this online slot also scores well but that is what you would come to expect from any NetEnt slot. Also, the way the game is laid out makes for an efficient online gambling experience and is something we really like as well. There is no clutter and playing the game is very straightforward due to this.